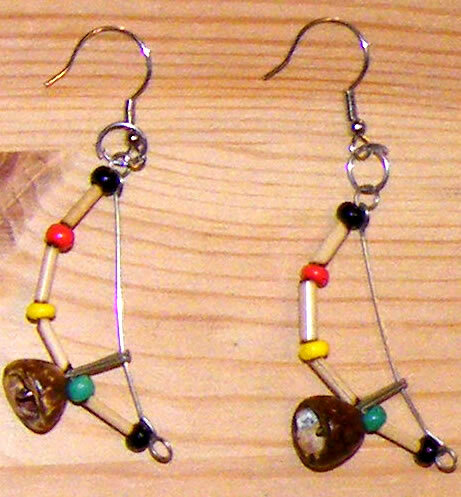 This handcrafted piece can be used as a pendant and also as an earring. It is about 4 cm long. The cabaca, shown in brown, is represented by a small coconut. The other light brown bits are pieces of bamboo. The berimbau is a musical instrument that is traditionally played with capoeira, which is the brazilian martial art. Capoeira is played at the sound of berimbau, atabaque and pandeiro (the last two are drum like instruments) and it is the art that brought liberty for thousands of slaves in colonial Brazil. Nowadays Capoeira is practiced in Brazil by people of all social classes. It is also practised across the world.